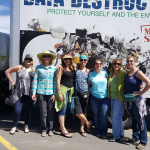 The Women of Evergreen Businesses organization has been a part of the Mountain Community since the Fall of 2003. Our group averages 22 to 25 women representing unique businesses. If you are interested in joining our group, please contact us through our Contact page. We invite eligible applicants to visit our monthly meetings twice before committing to join the group. Membership fees are collected annually in July. In addition to dues, we require all members to participate in our quarterly group advertisement in Colorado Serenity and participate in our community activities and fundraiser. Women of Evergreen Businesses is a 501(c)(3) organization. Donations to our organization may be tax-deductible. Please check with your tax advisor.